The classic Malham Round incorporating Janet’s Foss, Gordale Scar, Malham Cove and Malham Tarn – without doubt one of the finest walks in the Yorkshire Dales. 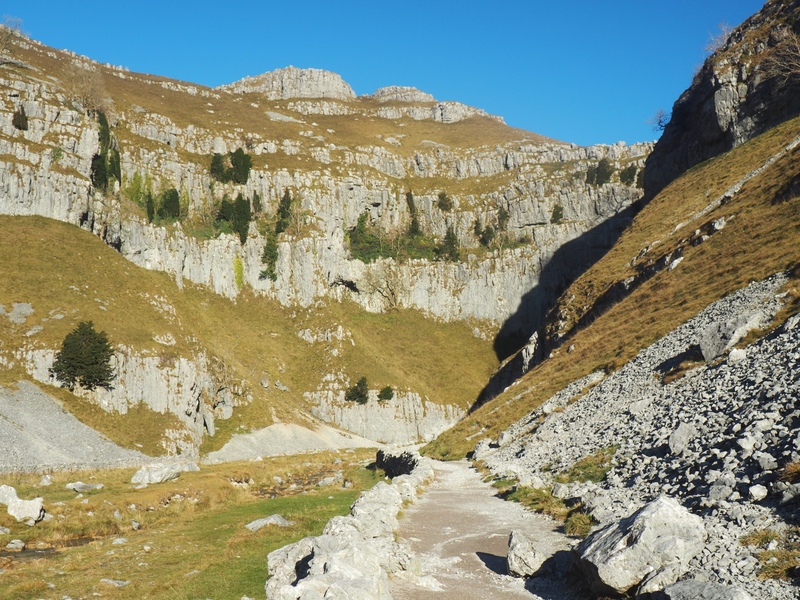 This circular walk from Malham via Janet’s Foss, Gordale Scar, Malham Tarn and Malham Cove is a classic and one I’ve done a number of times. On this occassion it was an opportunity to introduce the area to some of my friends from work. There was a beautiful clear sky above Malham when we arrived, which was quite remarkable as we’d driven through patchy fog all the way from Harrogate. Taking advantage of arriving early we were able to park on the roadside before the turn off for the car park. After a nice amble across some fields we entered Wedber Wood for the lovely litte walk alongside Gordale Beck to reach Janet’s Foss. This delightful waterfall is just the first of many highlights that this walk has to offer. Indeed the next highlight was just minutes away, the walk up into the awe inspiring limestone gorge of Gordale Scar. I’d been looking forward to us all tackling the scramble up alongside the waterfalls but, as with my previous visit in 2013, there had been too much recent rainfall to make this practical. Instead we had to retrace our steps to cross Gordale Beck by a single plank bridge, cross over a wall and join everyone else in tackling the steep grassy path leading up to New Close Knotts. It was hard work, particularly for those in the group who hadn’t done much hillwalking. We were rewarded though with increasingly good views to the south where Pendle Hill appeared island-like in a sea of valley fog. One of the benefits of this alternative route are the stunning views down into Gordale which can be enjoyed by following the path around the top of the scar from New Close Knotts until it finally meets up with the path climbing up from Gordale Falls. Having rejoined this route we then enjoyed a near level walk across limestone pastures to reach Street Gate and then on to Malham Tarn. After a bite to eat alongside the tarn we turned south along the Pennine Way passing Water Sinks and a rockier section of path. This was made slippery by the fact that the path was largely sheltered from the sun so had not been able to dry out after rain. Dropping down into Watlowes, a magnificent dry limestone valley, we finally reached the top of Malham Cove itself. Although this was my sixth visit to the top of Malham Cove I never fail to be impressed by the view or by the superb limestone pavement that covers the top of it. It really is a joy to walk across. All too soon though we had done just that so it was time to descend the steps down to the foot of the Cove before following the ‘tourist’ path back into Malham. The final highlight was in store for us when we got back to the car, the late evening sunshine combined with some grey cloud that had begun to roll in created some quite beautiful colours on the hillside above the village.